Local storefronts and community entrepreneurs are the focus of Randolph Township’s newly launched RandolphLocal.com initiative. With a competitive regional economy, the focus on Main Street is with good reason: a recent Small Business Administration report (http://bit.ly/2FaraOz) concluded that small businesses comprise 99.9% of all firms within the US and collectively employ 47% of the nation’s workforce. Randolph Township, a community of 25,000 residents, hosts well over 400 businesses including retail, restaurants, and professional services. Collaborating with Digital Strategy Associates LLC, Randolph Township developed a digital platform, centered around RandolphLocal.com, to attract new businesses and spearhead economic develop initiatives. Digital Strategy Associates LLC provided web design, graphic design, web hosting, project management, and digital communication consulting services to the Township. The corner market, the local diner, or the friendly neighborhood doctor. Small businesses not only contribute to the character of a community, but they also provide residents with convenient access to wide a range of retail shops and services which are only minutes away. Seeking to connect residents with their neighborhood businesses, we re-imagined RandolphLocal.com to create a brand new user experience. With a WordPress powered website and a sleek, modern design, RandolphLocal.com has been re-imagined into an interactive business directory. A large map and inviting search bar, allows residents to connect with businesses within seconds. High resolution graphics and images of the business community, provide an excellent backdrop while news and events sections provide additional opportunities for user engagement. As Amazon’s new HQ2 initiative has demonstrated, local government’s are increasingly competing for economic development opportunities. Leveraging the narratives of successful local entrepreneurs and complemented with the use of handcrafted infographics, RandolphLocal.com, provides a strong platform from which to market the Township to prospective businesses. Additionally, Google Analytics, which is installed on the website, provides the Township’s economic development staff with the ability to measure the success of new initiatives. 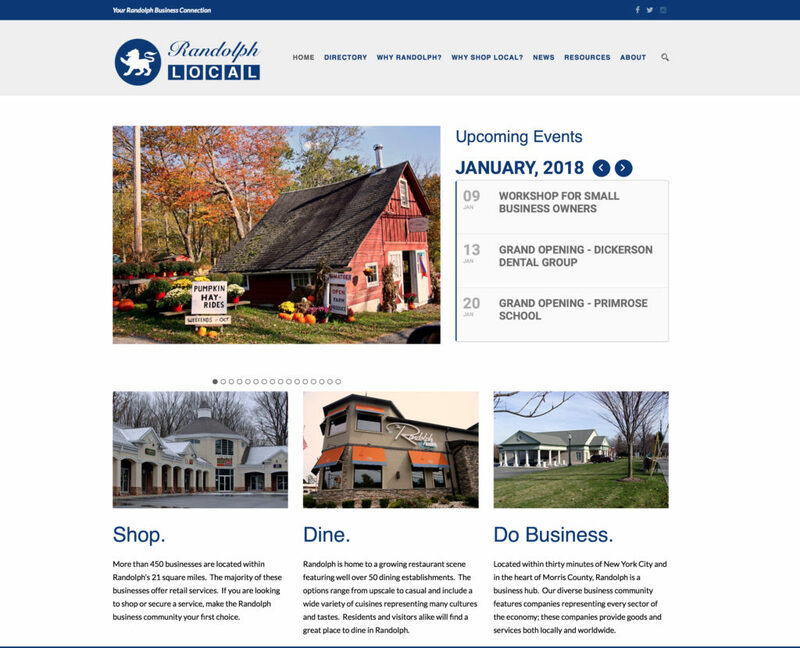 With the success of RandolphLocal.com, the Township is already planning additional economic development initiatives with the assistance of Digital Strategy Associates LLC. Future projects include a multi-faceted social media campaign and a new website section for business owners. We provide a comprehensive management solution for the Economic Development Committee’s digital assets including website, domain names, and web hosting. Our web developer’s support Township staff through help desk support and providing customized services on a retainer basis. The Township leverages our experience in digital marketing to provide specialized consulting when exploring new public information initiatives. Digital Strategy Associates collaborated with Township stakeholders to identify, develop, and implement a website design strategy that addresses their existing needs and future goals. The newly designed, responsive website, looks great across all devices and computers, including tablets and smartphones. With an easy to use content management system, staff can post news and announcements.